2011 Commission letters are provided as PDF files below. Download times of large PDFs will vary based on connection speed. Additional information on PDFs. Please note that Agency responses can be found in Appendix A of the Commission’s 2010-2011 annual report. Request from Peter Tyack, Ph.D., to amend a permit to conduct research on cetaceans in the Atlantic Ocean and Mediterranean Sea by adding procedures, focal species, and a new project in the Pacific Ocean. Request from the Lamont-Doherty Earth Observatory for authorization to take marine mammals by harassment incidental to a marine geophysical survey in the waters of the Northern Mariana Islands from February through March 2012. Permit request from Ann Pabst, Ph.D., for authorization to conduct systematic line transect surveys for marine mammals off the U.S. east coast during a five-year period. Request from the Northwest Fisheries Science Center for authorization to conduct research on 37 specified cetacean species, unidentified beaked and baleen whales, and pinnipeds. Request from the U.S. Army Corps of Engineers for authorization to take Atlantic bottlenose dolphins incidental to blasting operations in the Port of Miami, Florida. Request from Rachel Cartwright, Ph.D., to amend a current permit to allow tagging of female humpback whales with calves and yearlings in Hawaii. Request from Brandon Southall, Ph.D., to amend a current permit to add potential focal species and increase the number of controlled exposure experiments with cetaceans and pinnipeds in waters off Southern California. Permit request from SeaWorld, Inc., for authorization to conduct research on captive Hawaiian monk seals. Request from the U.S. Marine Corps for authorization to take Atlantic bottlenose dolphins incidental to training exercises at the Cherry Point Range Complex, North Carolina. Request from the U.S. Navy for authorization to take marine mammals by harassment incidental to a seismic oceanographic survey in the southwestern Indian Ocean. Permit application from Daniela Maldini, Ph.D., Pacific Whale foundation, to study humpback whales in Hawaii over a five-year period. Proposal to amend regulations governing the taking of marine mammals incidental to Navy training and testing operations in 12 range complexes. Request from Shell Offshore, Inc., for authorization to take marine mammals by harassment incidental to offshore exploratory drilling in Camden Bay, Beaufort Sea, Alaska. Request from Shell Offshore, Inc., for authorization to take marine mammals by harassment incidental to offshore exploratory drilling in Chukchi Sea, Alaska. Request from the National Marine Mammal Laboratory for a permit amendment to authorize harassment of ribbon, spotted, bearded, and ringed seals during low-level aerial surveys. Request from the Alaska SeaLife Center to amend its permit authorizing the taking by harassment of up to five captive adult Steller sea lions to study reproductive physiology of individuals from the eastern population. Request from Daniel Costa, Ph.D., University of California Santa Cruz, for authorization to collect samples from dead pinnipeds at Cape Evans, Backdoor Bay, and Hut Point, Antarctica. Comments on the draft 2011 stock assessment reports for marine mammals occurring in U.S. waters. Request for permit amendment from Paul Ponganis, Ph.D., University of California San Diego, for authorization to study California sea lions and to harass sea lions, harbor seals, northern elephant seals, and fur seals incidental to the research. Permit request from The Whale Museum for authorization to monitor vessel activities around southern resident killer whales in Washington over a five-year period. Application from the U.S. Army Corps of Engineers for authorization to take marine mammals incidental to wharf construction in San Francisco. Permit request from John Wise, Ph.D., University of Southern Maine, for authorization to receive, import, and export samples from cetaceans and pinnipeds for scientific research. Recommendation that Hawaiian monk seal recovery efforts be funded to at least $5.6 million for 2012. Recommendations intended to improve the Air Force’s efforts to manage impacts on marine mammals and marine ecosystems in the Gulf of Mexico. Recommendations intended to improve the Navy’s efforts to manage its impacts on marine mammals and marine ecosystems in the Gulf of Mexico. Intent to prepare an environmental impact statement to establish quotas for bowhead whale subsistence harvest by Alaska Natives. Permit application from Thomas Jefferson, Ph.D., Clymene Enterprises, for authorization to conduct research on cetaceans off the California coast over a five-year period. Comments on the Gulf Coast Ecosystem Restoration Task Force. Draft Programmatic Environmental Impact Statement on Hawaiian monk seal recovery actions. Proposed rule to terminate the translocation program for southern sea otters at San Nicolas Island. Apache Alaska Corporation application to take marine mammals by harassment incidental to seismic survey in Cook Inlet, Alaska. Lamont-Doherty Earth Observatory’s application to take marine mammals by harassment incidental to marine geophysical survey. Application from Oregon, Washington, and Idaho, to lethally remove pinnipeds preying on endangered and threatened stocks of salmon and steelhead in the Columbia River. Recommendations on the 2011 Draft Supplemental Environmental Impact Statement/Supplemental Overseas Environmental Impact Statement (DSEIS) for Surveillance Towed Array Sensor System Low Frequency Active sonar. Request from Cape Wind Associates for authorization to take small numbers of marine mammals by harassment. Comments on the False Killer Whale Take Reduction Plan. 2011 Marine Mammal Commission annual meeting follow up on agency response efforts to the BP Deepwater Horizon oil spill and ongoing assessment of natural resource damage. 2011 Marine Mammal Commission annual meeting follow up on research and support monitoring programs that continue/extend better management of the Gulf of Mexico’s marine ecosystem. Request from the Washington State Department of Natural Resources for authorization to take small numbers of harbor seals by harassment. Recommendations on call for information and nominations and notice of intent to prepare an environmental assessment on commercial wind lease issuance and site characterization for activities in waters off Rhode Island and Massachusetts. 2011 Marine Mammal Commission annual meeting follow up on Cook Inlet beluga whale conservation. Request from the U.S. Navy for regulations under the Marine Mammal Protection Act authorizing the taking of marine mammals incidental to training, testing, and routine military operations using the Navy’s Surveillance Towed Array Sensor System Low Frequency Active sonar source. 2011 Marine Mammal Commission annual meeting follow up on assessments of marine mammal stocks in the Gulf of Mexico. 2011 Marine Mammal Commission annual meeting follow up on Florida manatee conservation. 2011 Marine Mammal Commission annual meeting follow up on Louisiana’s response to the BP Deepwater Horizon oil spill and the state’s role in restoration activities. 2011 Marine Mammal Commission annual meeting follow up on Florida’s response to the BP Deepwater Horizon oil spill and the state’s role in restoration activities. 2011 Marine Mammal Commission annual meeting follow up on Alabama’s response to the BP Deepwater Horizon oil spill and the state’s role in restoration activities. 2011 Marine Mammal Commission annual meeting follow up on Mississippi’s response to the BP Deepwater Horizon oil spill and the state’s role in restoration activities. Request from the Port of Vancouver for authorization to take small numbers of marine mammals by harassment. Request from Brent Stewart, Ph.D., J.D., to renew permits authorizing research on pinnipeds in California. Request from Geo-Marine, Inc. for authorization to conduct systematic line transect surveys for marine mammals off the east coast of the United States. Request from Robert DiGiovanni for authorization to conduct surveys for marine mammals off the east coast of the United States. Comments on the Atlantic Large Whale Take Reduction Plan. Recommendations on fishery management issues that warrant further consideration and action, particularly related to observer programs, research and relocation trawls, and recreational fishing and boating. Request from Michael Adkesson, D.V.M., to amend permit authorizing scientific research on South American fur seals. Recommendations on the research and management activities needed to determine the causes of unusual marine mammal mortality events and to prevent or minimize these events’ effects on ecosystems of the northern Gulf of Mexico. Request from Red Rock Films for authorization to take up to 25 individual polar bears by harassment during filming activities in the North Slope Region and Arctic National Wildlife refuge of Alaska. Request from Sea to Shore Alliance for authorization to conduct research on West Indian manatees and to export/import samples collected from West African manatees. Request from Daniel P. Costa, Ph.D., to amend permit authorizing scientific research on various seal species and California sea lions. Request from the Scripps Institution of Oceanography for authorization to take small numbers of marine mammals by harassment. Request from the Alaska Department of Fish and Game to renew and amend permit authorization to conduct research on harbor seals in Alaska. Request from David Honig for authorization to import whale bones for scientific research. Request from Iskande Larkin to import samples from West Indian manatees for purposes of scientific research. Proposed rule to establish a manatee refuge in Kings Bay, Citrus County, Florida. Recommendations on Service’s Policy for Distinguishing Serious from Non-Serious Injuries of Marine Mammals. Recommendations on NOAA’s Scientific Integrity Policy and Handbook. Request from the Southwest Fisheries Science Center for authorization to conduct research on pinnipeds in Antarctica. Request from the U.S. Air Force to renew its authorization to take incidentally small numbers of marine mammals by harassment. Recommendations to the U.S. Department of State regarding vaquita conservation in the Gulf of California. Request from the Southwest Fisheries Science Center for authorization to conduct research on pinniped species in Antarctica. Review of the Bureau of Ocean Energy, Management, Regulation, and Enforcement’s draft environmental assessment on Commercial Wind Lease Issuance and Site Characterization Activities on the Atlantic Outer Continental Shelf. Review of the U.S. 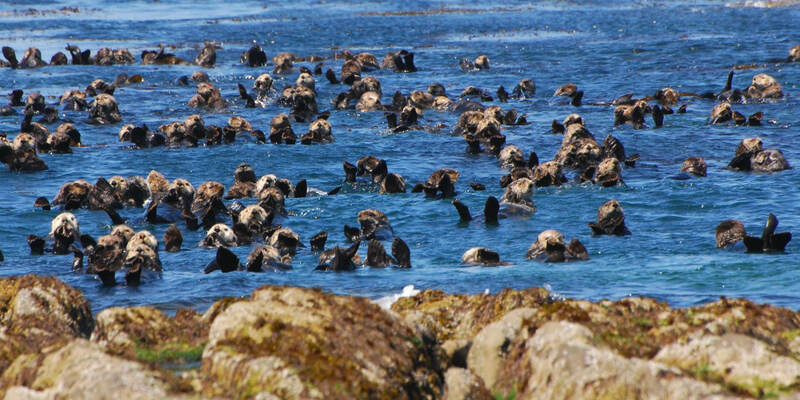 Fish and Wildlife Service’s Draft Evaluation of the Southern Sea Otter Translocation Program. Request from the University of Alaska Geophysics Institute for authorization to take small numbers of marine mammals by harassment. Request from BP Exploration for new regulations authorizing the take of small numbers of marine mammals incidental to the operation of its Northstar Facility, Alaska. National Marine Fisheries Service proposed rules to expand critical habitat boundaries for the endangered Hawaiian monk seal. Transmission of Commission report, “Assessing the Long-term Effects of the BP Deepwater Horizon Oil Spill on Marine Mammals in the Gulf of Mexico: A Statement of Research Needs”. Proposed rulemaking regarding the List of Fisheries for 2012. Request from the U.S. Fish and Wildlife Service for authorization to conduct research on walruses in the Bering and Chukachi Seas. Request from the Gulf and South Atlantic Fisheries Foundation, Inc. for an exempted fishing permit. Request from the Bureau of Ocean Energy Management, Regulation, and Enforcement for authorization to take small numbers of cetaceans incidental to oil and gas industry-sponsored surveys. Request from Dr. Tom Smith for amendments to the authorization to harass 18 polar bears while conducting den monitoring in Alaska. Request from Matson’s Laboratory, LLC to import more than 500 polar bear teeth per year. Request from Blank Park Zoo to import up to five non-releasable harbor seals or California sea lions for public display. Request from the U.S. Geological Survey to take small numbers of marine mammals by harassment. Request from Dr. Jennifer Lewis to conduct research on bottlenose dolphins. Request from the U.S. Fish and Wildlife Service to conduct field work to study Pacific walruses. Amendment of regulations governing the taking of marine mammals incidental to military training operations. Request from Robert Pitman to amend permit to conduct research on cetaceans in the Antarctic. Request from PRBO Conservation Science to take small numbers of marine mammals by harassment. Request from Cher-Ae Heights Indian Community of Trinidad Rancheria to take small numbers of marine mammals by harassment. Request from Statoil USA E&P Inc. to take small numbers of marine mammals by harassment. Request from Monterey Bay National Marine Sanctuary to take small numbers of marine mammals by harassment. Request from Glacier Bay National Park and Reserve to conduct research on humpback, killer, and minke whales in southeastern Alaska. Request from the Navy to obtain up to six stranded, non-releasable, neonate, male or female sea lion pups from The Marine Mammal Center (CA). Request from the U.S. Geological Survey, The Sirenia Project, to conduct research on West Indian manatees. Request from Alaska SeaLife Center to conduct research on Weddell seals in Antarctica. Request from Waikiki Aquarium to hold up to three permanently captive Hawaiian monk seals at any given time. Request from Oceanic Nature Film Productions to take marine mammals by Level B harassment. Request from the Lamont-Doherty Earth Observatory for authorization to take small numbers of marine mammals by harassment. Request from Dr. Rebecca Dickhut to import samples of marine mammal species for scientific research. Request from Dr. Paul Nachtigall to conduct research on 38 cetacean species. Recommendations on draft environmental assessment for public display permit for sea lions at the Institute for Marine Mammal Studies (MS). Comments on the development of a port access route study for U.S. waters in the Bering Strait. Request from United Launch Alliance to renew authorization to take marine mammals incidental to launch activities at Vandenberg Air Force Base. Request from the National Marine Mammal Laboratory to amend an existing permit authorizing research on Steller sea lions. Request from North Pacific Universities Marine Mammal Research Consortium to amend an existing permit authorizing research on pinnipeds. Request from Mithriel MacKay, Texas A&M University, for authorization to conduct research on humpback whales in waters off Puerto Rico. Request from Alaska Department of Fish and Game to renew and amend an existing permit to conduct research on pinnipeds. Request from Mote Marine Laboratory to renew an existing permit to harass manatees. Requests from the Alaska Department of Transportation and Public Facilities and the Aleutians East Borough to renew authorizations to take northern sea otters by harassment. Request from the U.S. Geological Survey for authorization to take small numbers of marine mammals by harassment. Request from the National Marine Fisheries Service for authorization to remove 19 Galapagos sharks from waters around French Frigate Shoals. Request from the Sonoma County (CA) Water Agency to renew its authorization to take marine mammals by harassment. Potential for wind energy production in marine areas off Massachusetts. Request from Alaska SeaLife Center for authorization to conduct research on Weddell seals in Antarctica. Request from the National Marine Mammal Laboratory to renew and amend an existing permit authorizing research on pinnipeds off the U.S. West Coast. Proposed rule and request from Alaska Oil and Gas Association for authorization to take polar bears and walruses in the Beaufort Sea and off the adjacent northern coast of Alaska. Request from Wild Horizons, Ltd., for authorization to harass Alaska sea otters during filming activities in Glacier Bay and Prince William Sound. Request from Robin Baird, Ph.D., for authorization to conduct research on 40 species of cetaceans and to harass 7 species of pinnipeds. Intent to prepare an environmental impact statement on its 2012–2017 oil and gas leasing program in the Gulf of Mexico. Proposed rule and 12-month finding on a petition to list certain subspecies of ringed seals under the Endangered Species Act. Proposed rule and 12-month finding on a petition to list the bearded seal under the Endangered Species Act. Request from the U.S. Geological Survey, Alaska Science Center for amendment of an existing permit. Request from the U.S. Navy for authorization to take small numbers of marine mammals. Request from Lamont-Doherty Earth Observatory to take small numbers of marine mammals incidental to a marine seismic survey in the eastern tropical Pacific Ocean. Concern over scientific independence of the Cook Inlet Beluga Whale Recovery Team. Request from Jennifer Burns, Ph.D., to obtain, import, and export marine mammal samples. The Navy’s revised Integrated Comprehensive Monitoring Program plan. Request from Alaska SeaLife Center for amendment of an existing permit. Request from the U.S. Navy for authorization to take small numbers of marine mammals incidental to a test program in Hood Canal, Bangor, Washington. Request from Wild Horizons, Ltd., for authorization to harass bottlenose dolphins during filming activities. Request from Waikiki Aquarium for authorization to conduct research on captive Hawaiian monk seals and expand related enhancement efforts. Request from Burke Museum of Natural History and Culture for authorization to import and export marine mammal parts. Request from R. Natalie Goodall to salvage and export skeletal remains of marine mammals from Antarctica. Request from Dan Salden, Ph.D., for authorization to conduct research on cetaceans in Hawaii waters. Request from Alaska SeaLife Center for amendment of existing permit. Proposed delisting of the eastern distinct population of Steller sea lions. Proposed listing of the Hawaiian insular false killer whale as endangered. Request from Floragenex, Inc., for authorization to import tissue samples from polar bears. Draft recovery plan for the distinct population segment of northern sea otters in southwest Alaska. Request from Neptune LNG LLC to take marine mammals incidental to operations of its deepwater port. Proposed interim final rule pertaining to Steller sea lion protection measures in the Alaska groundfish fisheries. Request from Aleut Community of St. Paul Island for amendment of an existing permit. Request from Craig Matkin, North Gulf Oceanic Society, for authorization to conduct research on cetaceans in Alaska waters. Transfer of dolphins from the U.S. Navy to the Institute for Marine Mammal Studies. Request from Randall Davis, Ph.D., for renewal of an existing permit. Request from the National Marine Mammal Laboratory for amendment of an existing permit. Request from Alaska Aerospace Corporation for authorization of incidental take of harbor seals and Steller sea lions relative to space launches. Intent to prepare an environmental assessment for proposed seismic surveys in the Beaufort and Chukchi Seas. Scientific independence of members of the Cook Inlet Beluga Whale Recovery Team. Request for revision of permit application, Thomas Postel. Request from the Fish and Wildlife Service for authorization of incidental take of pinnipeds in Alaska. Request from St. George Reef Lighthouse Preservation Society for authorization of incidental take of pinnipeds off California. Listing the Pacific walrus as threatened under the Endangered Species Act. Intent to prepare a supplemental environment impact statement for oil and gas lease sales in the Gulf of Mexico.